Northern California Corvette racers Bob Eagleson and Ed McCarroll built this Kurtis-based Chevrolet-powered Special and raced it in NoCal events in 1962. Ed McCarroll, behind the wheel in blue driving suit; Bob Eagleson, sitting on the rear deck in red driving suit. 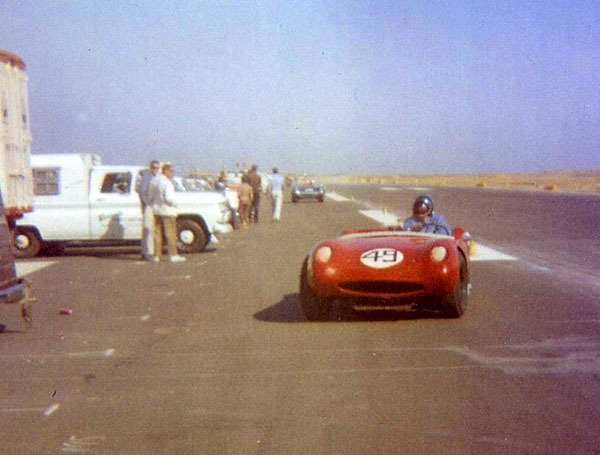 From Ed McCarroll: "Our first main event race was at the Port of Stockton, April 14-15, 1962, with Bob at the wheel. The car started to overheat so it was a DNF." More from Ed: "On July 14, 1962 we ran the car at the Grand Opening of the Oakland Airport races. I won the race for Novice and Junior drivers, 1st in class and 1st overall. Bob drove in the main event for Senior drivers and finished 2nd in class." More from Ed: "We went to Stead AFB, September 22-23, 1962, for the races. I finished 1st overall and 1st in class again in the Junior/Novice race. Bob finished 3rd in the main event. We clocked 157 mph through the traps that day". "I first met Bob Eagleson at Vaca Valley Raceway in the winter of 1960. We were at the SCCA driver school in our Corvettes. He went over the bank in Turn 1 and was stuck in the mud. I helped pull him out of the mud and it became a lasting friendship. Later Bob totaled his Corvette in Niles Canyon and that triggered us to build the Corvette Special. We purchased a bare bones Kurtis frame with torsion bar suspension. With that we took all the major parts from his Corvette and put them into the Special. We utilized the rear end, 4-speed transmission, and 327 Corvette engine with Rochester fuel injection. We put in an aluminum flywheel, scatter shield, and Iskendarian RR2 roller cam." The body was built by Acme Fiberglass in San Francisco, using the basic Mistral shape. I made design changes to accommodate our ideas in the car. Acme had fabricated Indy car bodies in Indiana and had just moved to S.F. to make fiberglass body parts for Corvettes. On a Sunday afternoon we finally got the car running. Started it and backed it out of the garage and Bob said, "Do you want to take a ride around the block?" With no body, open exhaust, not seats (just boxes) we took off and the next thing I knew we were heading up Niles Canyon in Sunday afternoon traffic. When we got to the top of the mountain Bob pulled the car over and said, "You drive it back without getting a ticket". Bob always pushed the envelope. After we campaigned the car successfully in 1962, Bob, who always wanted to dice for position, wanted to go into sprint cars which was fine with me but not with his wife. It caused a divorce and finally the #49 Kurtis had to be sold. The new owner had everything X-rayed and found on the Pittman arm a large crack inside the covering that was not visible. It makes you wonder what would have happened if it had broken during a race." 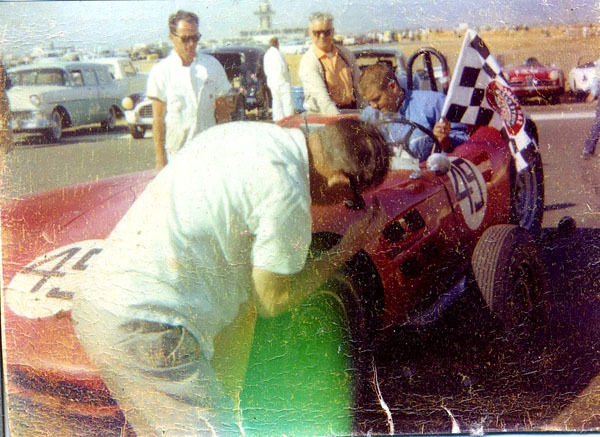 Ed and Bob sold their car to Joshua Saslove, who raced it frequently and fearlessly in 1963. "I just wonder about this chassis. 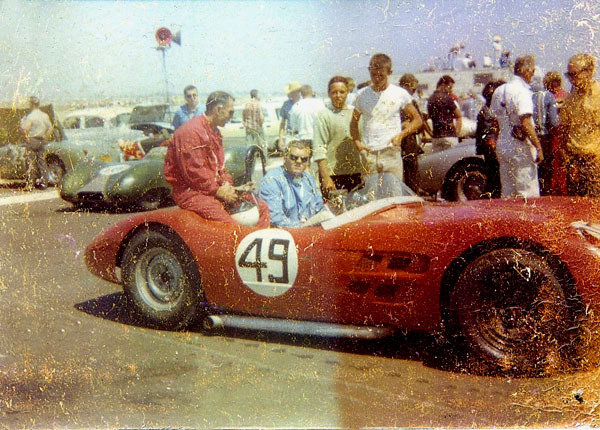 Bill Campbell later re-bodied the Mistral car with a fiberglass body that looked like an E Jag. He called it the Alligator. I asked Doug Hooper, who won a couple of club races with the Alligator, what had happened to the car. He said it was sold to a guy in the CalClub and that was the last he had heard of it. The big question still is, was the Eagleson/McCarroll car bodied at Kurtis and the original body lost or is it just a random chassis? "To the best of my knowledge, Kurtis made the four complete cars and two extra chassis. Ak Miller was given one and the other went to the Mistral car... I think. I think that's right." Does anyone know of a Kurtis chassis that could possibly have ended up in a South San Francisco junkyard in 1961?